Quite often, Toyota Prius owner gets stranded on the road or are held up at home because the car would not start. When the car does not start, most people normally conclude that the problem is with the dead Prius hybrid battery and proceed to repair the main battery. However, many times the main battery may not at all be the problem, but the 12 volt battery in the Prius which is the culprit. If the 12 volt accessory battery is dead, the car would not start. It is as simple as that. Luckily, it is much easier to repair a 12 volt battery than work on the hybrid cells. As a first step, the Prius battery’s cover should be opened. This can be done by pulling the handle situated right at the bottom left of the steering wheel. After that the plastic protector to the battery located on the right-hand side of the engine should be opened and next, the small red plastic lid covering the positive port of the battery should be opened. There is a positive cable, which has a white line painted on the rubber. This positive cable should be clipped to the positive port of the car providing the electric current from the Prius hybrid battery. 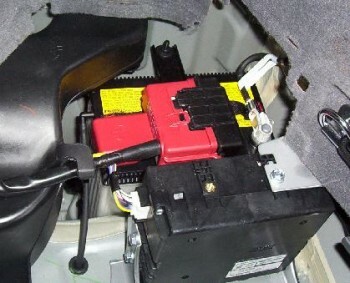 The negative cable (black in color) should be clipped to the negative port of the car giving electric current, while doing this; it should be ensured that the other end does not touch any other metal before connecting to the Prius main cells as electric current may already be flowing through the cables. Next step is to start the car to provide the charge and press the accelerator a little so that sufficient current flows to spark the 12 volts battery in the Prius. After charging the battery, you should start your car and drive for at least 20 minutes without switching off the engine. This will recharge the battery sufficiently and ensure that it will not become dead, when the engine is turned off. Those using a battery charger should start the Prius and leave it charging overnight. With all the steps, if your Prius battery still does not work, it means that there is a more serious problem with the hybrid cells. It costs around $5000 to buy hybrid cells without warranty from Toyota. As this option is quite costly, it is much cheaper to repair the dead Prius cells via a Do It Yourself (DIY) approach thereby saving around $4000. The dead Prius battery cells can be replaced with the help of DIY replacement guide. The repair guide is prepared by experienced mechanics that specialize in reconstructing HB packs. The guide gives step by step instructions with detailed pictures. Alternatively, those not keen in buying new battery cells from Toyota spending $5000; they can buy rebuilt the battery pack by spending half of that money. However, this still works out costly. Considering all available options, it is highly recommended to take the help of Prius Hybrid guide and repair it by the user himself. Is there a cheaper option to replace the battery pack on a Toyota Prius? As a matter of fact, the guys at www.hybridbatteryrebuild.com can get the battery replaced for under $500. Want to know they can get it done so cheap? Click on the link below to learn the answer. 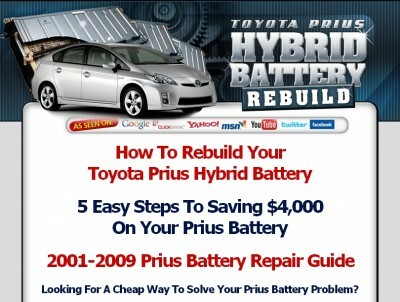 ==> Click here to visit Prius Battery Replacement Guide!